Besides the show from Copenhagen recorded on March 1, 1972, the release includes three bonus tracks recorded live in New York on May 29, 1973 and an interview recorded during the 1971 Australia tour. 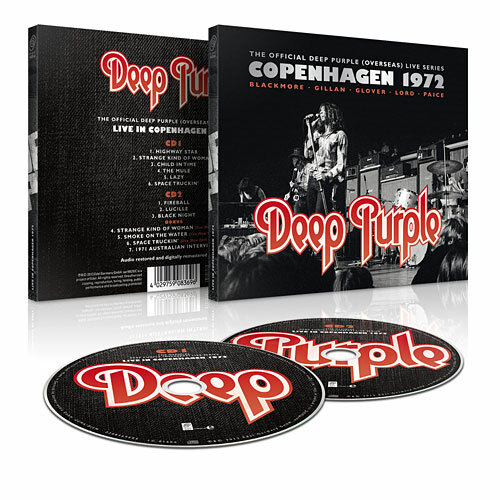 “Copenhagen 1972” will be released restored and digital remastered on May 31, 2013. Posted by andreas on Sunday, May 19th, 2013, filed under News. You can follow comment on this post through the RSS 2.0 feed. You can leave a comment below, or trackback from your own site. Aren’t the 3 bonus tracks from the Long Island College show that was/is the source of the only real COLOR footage of MK II? Yes, it is the source. Most of us probably have this on DVD already. I have this in dvd format…P&B..is the same? Time to release shows that haven’t been officialy released yet! remind me what was part 1? Really dont understand the policy behind these kinda releases. – Why these re-issues when they already are out on Sonic Zoom? I know that Sonic Zoom-releases have changed the l-r channel for some daft reason. But is that enough to merit a whole new catalogue of re-releases? why the stormbringer era logo, its shoddy as….get it right! I just ordered and received the Sonic Zoom edition not 2 weeks ago to pad an order from Amazon for free shipping even though I had the DVD. Much rather would have had this (cheaper in the US) version for the interview since I already have the ’73 songs on DVD. Pre-ordered mine a month ago. Saw them a couple weeks before the New York show in 1973. Looking forward to this re-master. Have this show already too but any new release from Purp!e is always a treat. stormbringer logo would be the most used today, there is a reason, i guess. These bonus tracks should be interesting. I saw Deep Purple for the first time on June 1 1973 at the New Haven coliseum, just 3 days after these bonus tracks were recorded. To this day that was the BEST concert I have ever seen in my life – and I have seen ALOT of concerts from many different bands in my 55 years of living. I still have my ticket stub. My seat cost $3.50. Sat right in back of Ian Paice. If my arms were 10ft longer I probably could have touched him. Billy Preston was the opening act. not only the re-released live albums which everyone already bought it,….it bores us! There is another new remastered version of this concert available on the web somewhere.